This is cause for celebration. 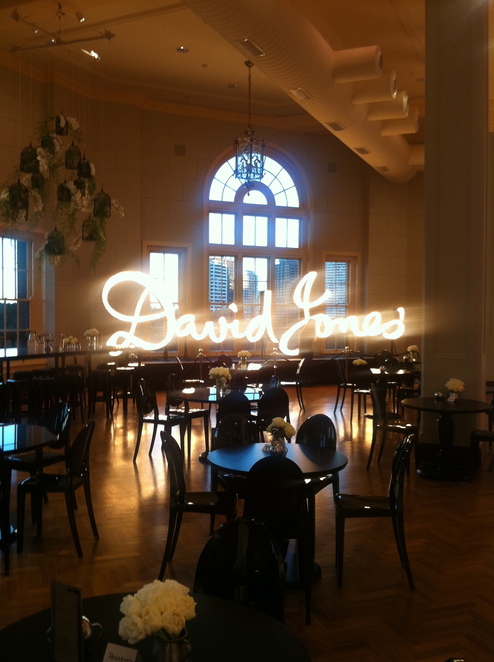 Whilst many retailers quickly open and close their doors before they even get a chance to prove their worth, Australia's most elegant department store, David Jones, is commemorating 175 years of service in 2013 with a series of special events. The spotlight is now on this Aussie retail icon, and David Jones was (and still is) a highly respectable retailer today. 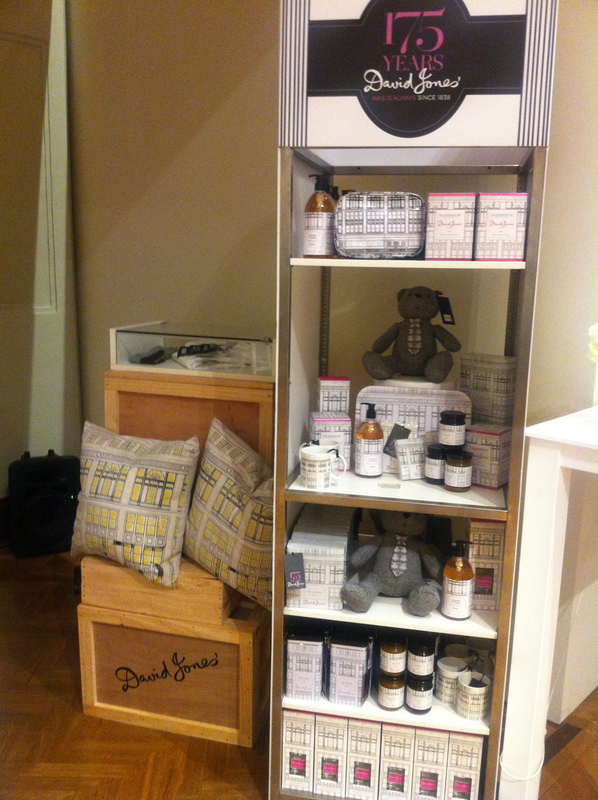 More popular with the older Australians, David Jones is beginning to open up a soft spot with the younger generation too. This has given the Elizabeth Street store every excuse to open up their 7th floor (normally reserved for weddings and private functions), and bring out the best of the best archives out of storage for all of Sydney to see, view and appreciate. It is fascinating to see so much history spread over one floor, and with ample walking space too. A respectable way to celebrate Australia's, if not the world's oldest department store with a Harrods feel. You can either head up to level 7 floor by floor via the escalators, or take the lift from the ground floor up. Coming out from the lifts, heritage showcases beckon with beautiful white flowers, one of the brand's true colours. 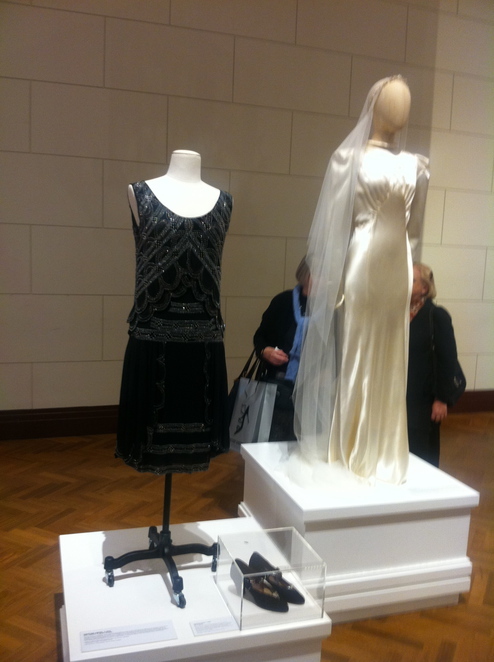 The highlight is all about the Royal Visit to David Jones in Sydney by Queen Elizabeth II in 1954. Head further in to your right, and you will enjoy some artworks you would never have seen before. Colourful and educational. You would be forgiven for thinking that you're stepping foot into a traditional art gallery. Funnily enough, you're right near the Art Gallery of New South Wales. You will also learn the relevance of the black and white patterns that symbolise the brand today, and many opportunities to step back in time with Cissie Lowry, who was David Jones' fashion buyer for an amazing 56 years. The guest book at the exhibition. Also look out for a tech version. Additional archetypal contents can be viewed on iPads, where the old meets modern technology, and a chance to bask in the views of lovely Hyde Park across the road, with elegance. Furthermore, there is a mini theatre (in the images uploaded to this article, some 'black' cushions to sit on), where you can view some old advertisements, and even see what their Market Street Food hall looked like back in 1984. 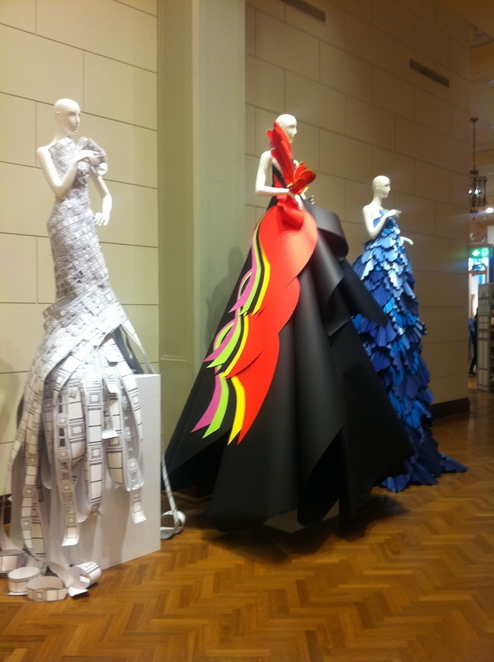 A chance to see fashion evolve simultaneously. Also a well executed and creative exhibition, clever. Speaking of food, the old further meets the new where you can also view the classic china and silverware served in the Great Restaurant, and a beautiful food hub called The Lacquer Room has just opened up in time for this exhibition, and is an integral part of it. Your chance has come to enjoy some high tea at either 11am or at 2:30pm daily for only $35 per person, or $45 per person if you want some sparkle to your high tea. Bookings for the high tea experience are essential, and can be made by clicking here. 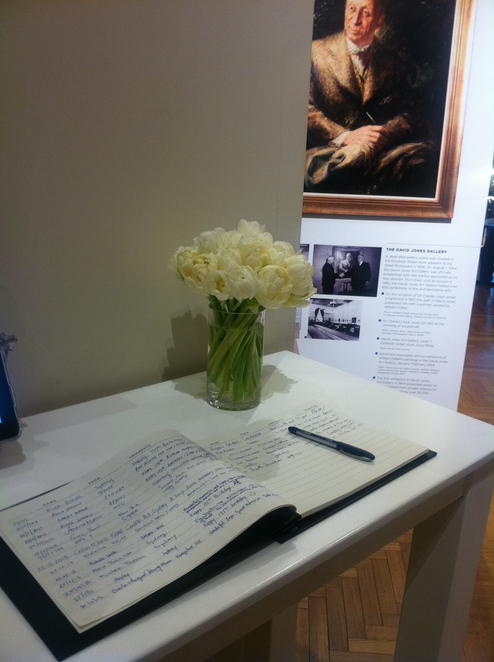 To add a touch to the armour of David Jones' elegance and beauty, all who attend this exhibition also have a chance to sign the guest book and leave their comments. Fancy a memento of your visit to take home with you? Why not get a digital photo of yourself taken. You choose the shade. Simply enter your full name and e-mail address on an iPad afterwards, and the image is e-mailed to you instantly. Otherwise, selected merchandise from cups, trays, scarves, umbrellas and delicious Glasshouse Fragrances candles to name are also on sale. 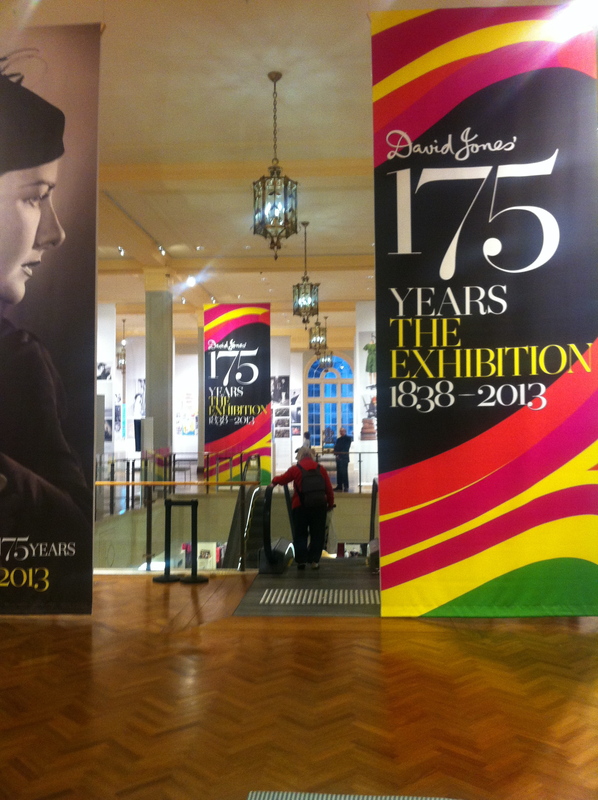 Near the photo booth and screening room, you will find a shop to browse and/or buy a selected David Jones 175th anniversary souvenir. Absolutely delightful. The exhibition is open during David Jones' normal store trading hours at their Elizabeth Street store. 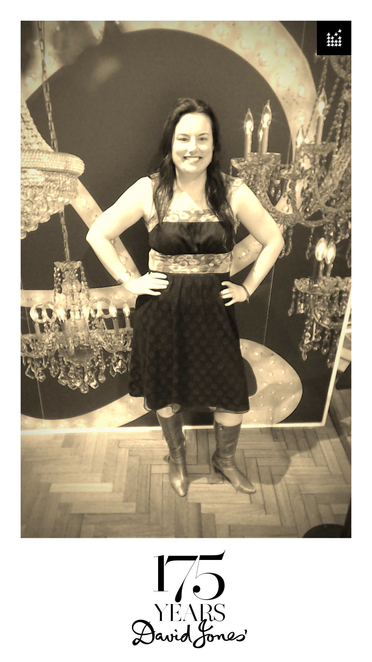 A photo of the writer of this article, taken at the exhibitions photo booth on exhibition opening day. Why? To celebrate the department stores 175th anniversary, they have put on a free exhibition. When: During David Jones' normal store trading hours during event period. 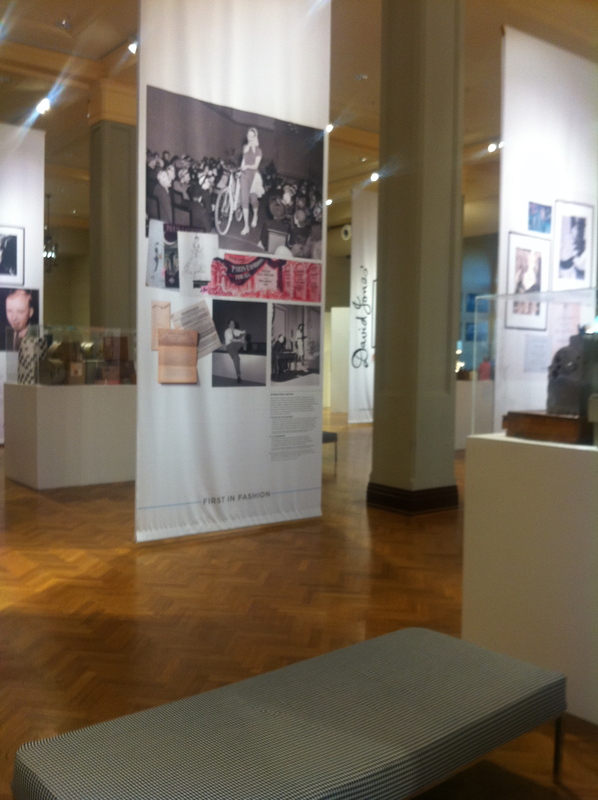 High Tea @ The Lacquer Room is available at 11am and 2:30pm daily during exhibition period. Cost: Free. High tea from $35-40 per person. However, merchandise items are available for sale.